How Have the Packers Fared in Their 2018 Draft Slots? The NFL Draft is just a day away. After a disappointing 2017 season, the Green Bay Packers find themselves in a rare position, holding their highest overall pick since 2009. Green Bay is slated to pick 14th tomorrow, which would be their only top-20 selection since taking B.J. Raji ninth nine years ago. The Packers will also enter the weekend with plenty of ammo as they look to re-tool their roster. Green Bay’s 12 picks are the most in the league, and if the Packers stand pat with those selections, it would be the most they’ve made since taking 12 players in the 2006 draft. Green Bay is obviously hoping to add many key pieces to make another title run, and they’ll rely on the contributions of some rookies to do so. Based on the Packers’ draft history, how well have they done with selecting players in their current draft positions? The Packers have done well drafting 14th, albeit in a small sample size. Their most recent pick, TE Bubba Franks, was not outstanding but served as a solid red zone threat during eight years with Green Bay. He scored 32 touchdowns with the Packers and made three straight Pro Bowls from 2001-2003. More notably, Green Bay took LB Dave Robinson in that slot in 1963. The 3x First-Team All-Pro and member of the NFL’s 1960s All-Decade team was inducted into the Hall of Fame in 2013. 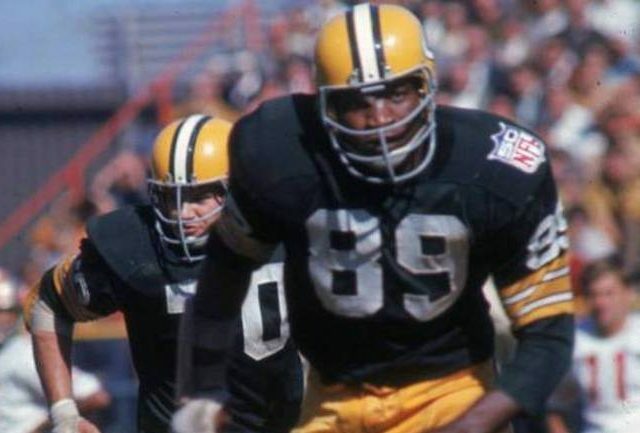 Green Bay has only held the 45th overall pick once, selecting DT Fred Heron out of San Jose State in 1966. Vince Lombardi traded Heron to the St. Louis Cardinals before he ever appeared in a game for the Packers. He had a rather uneventful seven-year career with St. Louis. The Packers have picked five times at #76, but haven’t done so in the past 50 years. None of their past picks amounted to much during their respective times in the NFL. Perko played just one season in the NFL, fizzling out after his rookie year with Green Bay. Culpepper had the lengthiest career of the Packers’ four 101st overall picks, spending six years in the pros. However, he never played for Green Bay, making #101 another historically inconsequential draft slot for the Packers. Of the selections discussed so far, the #133 pick is the most recent one that the Packers have drafted from. Green Bay took McMillian in 2012, who had a brief two-year career where he struggled at safety as the team tried to overcome the loss of Nick Collins. The best player Green Bay picked at this slot was punter Josh Bidwell, who had a 12-year professional career. Bidwell started every game for nine straight years, averaging 42.7 yards per punt over his time with Green Bay, Tampa Bay, and Washington. Once again, the Packers’ draft history in the 138th slot is nothing to write home about. None of the four players had noteworthy careers, and Green Bay hasn’t chosen anyone in that position since the 70’s. The 172nd pick is notable simply because the Packers have picked there nine times over the course of their draft history. Of those players, Gofourth had the most successful career, being the only one to play for more than five seasons. He spent six years with Green Bay before joining the Chargers in 1983. Gofourth started 70 games at left guard for the Packers, including three straight years starting all 16 games (1978-1980). Two slots after making nine past selections, the Packers have picked just once at #174. Lewis never appeared in a game for the Packers. Afflis appeared in 48 games for the Packers. No one else in this slot did anything of note with Green Bay. The three picks from the 1950s appeared in a combined two professional games in the NFL. Barrington served as a backup during three years with Green Bay. His best year came in 2014, when he played in 14 games and recorded 53 tackles and his only career sack. An injury derailed his 2015 season, but he was named the Packers’ nominee for the Walter Payton Man of the Year Award that year. Barrington was released a year later. Johnson also failed to appear in an NFL game. The Packers have little history drafting in their current slots. The best player taken using any of 2018’s positions is undoubtedly Hall of Famer Dave Robinson. Green Bay has only found themselves in these positions a combined three times in the 21st century, taking Barrington, McMillian, and Franks since then. It seems unlikely that Green Bay remains in all 12 of these spots, but it wouldn’t be very hard to improve on their past fortunes if they choose to stand pat. This entry was posted in Packers 2018-2019 Season, Sean Blashe and tagged Bubba Franks, dave robinson, Green Bay Packers, Jerron McMillian, NFL Draft, Sam Barrington. Bookmark the permalink.